Group buying industry is booming in Australia according recent research of Telsyte (business unit of Gibson Quai-AAS Consulting) and the market will grow 284% this year. The research covers over 20 group buying web sites that offer heavily discounted group deals for Australians. Over 79% of the market share reported to be taken by four leading players (Spreets, Scoopon, Jump On It, and Cudo). This figures correspond quite well with the study that we did last fall. •	Arrival of large online multi-nationals such as Google, Facebook and Groupon into the local group buying market (actually GroupOn is already here). •	Agencies representing merchants in deal negations and analytics. •	Proliferation of mobile group buying applications (at least Scoopon and one new smaller – CrowdSauce already have iPhone apps). •	Local media publishers entering the group buying industry through white-label software platforms, acquisitions, or distribution partnerships (we also already see it, with Telstra/Sensis that launched YellowPage Offers). Group buying industry in Australia becomes more and more interesting. In addition to the legal fight between GroupOn and Scoopon we may see one more battle. However, Buyii founder refuses to comply with Cudo’s demands and plan to show Cudo’s deals in the future, while did some changes in the site design (like removed Cudo’s logo from their home page). Would be interesting to see how the conflict develops. 20 January 2011 Yahoo! announced purchase of Spreets, one of the most successful group buying web sites in Australia (according Altima Interactive research and opinions of other market participants and observers). According the official press-release published at Yahoo!7 corporate web site Spreets has 500,000 subscribers and sales of 274,000 vauchers since it’s inception. The financial terms of deal are not disclosed in official PR, but according to SmartCompany the price that Yahoo!7 pays is around $40 million. 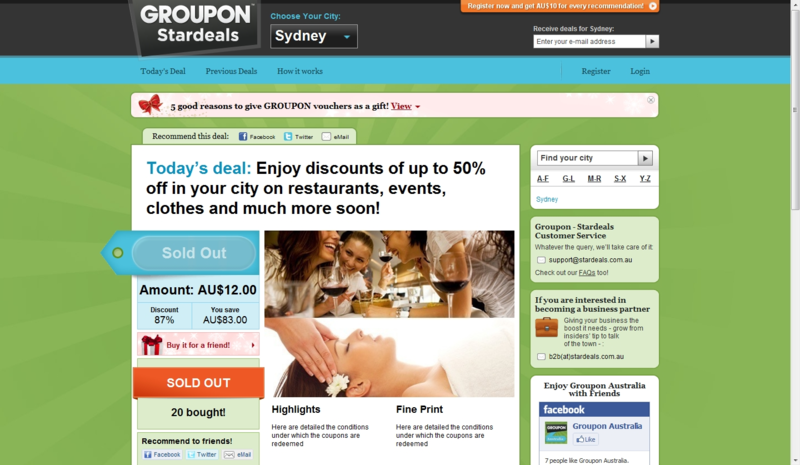 GroupOn came to Australia as StarDeals.Com.Au? 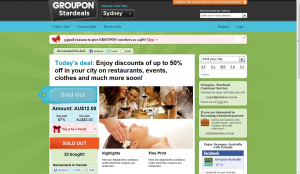 Interesting to note that domain stardeals.com.au is registered by Groupon Europe GmbH. We’ll see how it will develop, but if this is real attempt to launch in Australia, not a kind of exercise, it looks rather strange: why advertise in Google obviously ‘under constraction’ kind of site. Probably the reason is to start collecting subscribers database, but it can be done in a simpler way, with kind of “coming soon, leave your email’ temporary web page rather then unfinished piece of work with broken links. I admit that noticed this interesting article a bit late (it is dated end of November), but later is better than never. So, Patrick Stafford from SmartCompany wrote a good, comprehencive review of group buying industry in Australia. It’s a pretty long article that gives ABC of the group buying model and reviews the state of market in Australia, so I would recommend everybody interested in the industry to check it. Especially agreeable, that Patric cited our research (while unfortunately forget to put a link to it). As SmartCompany wrote today, there are strong rumors that Google purchased GroupOn for 2.5 billion USD. The deal supposedly was closed earlier this month. Interesting to note, that earlier GroupOn reportedly rejected on offer from Yahoo! (US$1.7 billion). GroupOn is a pioneer of group buyng, with over 20 million customers in 29 countries. Update: new rumors circulating indicate that GroupOn’s purchase price will be even higher, $US6 billion! If it is true it will be the biggers Google purchase! Update2: GroupOn board decided to decline deal with Google. Things are getting even more interesting, some people start to believe that it is the milestone, marking the end of the Google Era in Internet. 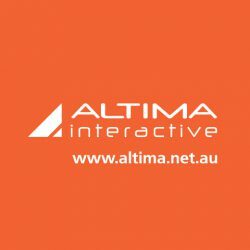 StartupSmart web site recently has posted an article “Is there any start-up mileage left in the group buying model?” with the reference to Altima Interactive. The article, written by Alexandra Cain, explains the group buying model, analyzes the current state of the market and cites experts opinion, including Altima Interactive founder Alex Levashov (aka myself). The research announced in our previous post is ready! You will find the way to download the full report (17 pages PDF file) at the end of the post. 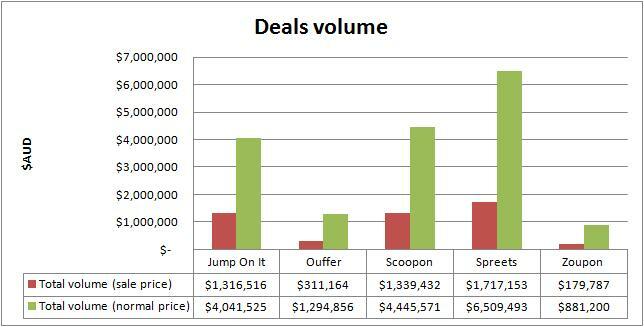 Who is the biggest player on the hot group buying market in Australia? Comparative research. After the phenomenal success of GroupOn, new group buying (group purchasing) web sites had started to appear virtually every day. It is extremely hot trend and even in Australia we have many of them. One day I asked myself, who is the leader of this market? Who close deals more often, attract more consumers and get highest volume of the transaction? So when I got some spare time, I conducted a small research to answer this questions and find out more insights.